Hermosa casa nueva construida con una atención al detalle. El dormitorio principal (con cama king size) con baño en suite y sala de estar son todas en la planta principal envuelto alrededor de un luminoso patio / patio. El segundo piso tiene otro dormitorio en suite (con cama de matrimonio) y sala con zona de oficinas. Hay un patio soleado fuera de la guarida. El tercer piso es una terraza en la azotea con una mesa de comedor y cuenta con magníficas vistas. Casa Esteban está situado en una calle bordeada buganvillas tranquila que está a pocos minutos de los Jardines, el centro de San Miguel. La casa está en la calle por lo que es tranquilo y pacífico situado. La casa capta la cultura y el ambiente de San Miguel, con todas las comodidades modernas para hacer su estancia una experiencia placentera e inolvidable. Nuestra esperanza es que te va a encantar nuestra casa tanto como lo hacemos nosotros y pensar en él como su casa en San Miguel. Recientemente, hemos instalado agua caliente solar y electricidad, lo que hace que su estancia con nosotros sea muy ecológica. Por favor, consulte el calendario de disponibilidad, lo mantenemos al día y siempre es exacta. Póngase en contacto con nosotros por correo electrónico ya que estamos muy a menudo viajando. We have stayed in Esteban numerous times over the years and have loved every moment. We couldn’t imagine staying any place else when visiting San Miguel. Esteban is located in an picturesque area of San Miguel with cobbled stoned streets lined with well-kept colourful homes with outside walls covered in bougainvillea. The house itself is quiet and beautifully taken care of. There are three different patios on three different floors that can be used for meals or simply to relax on and read. The kitchen is very well equipped and comes with a fridge that even makes ice cubes which is so appreciated for those needed drinks after a hot day walking around San Miguel. The rest of the house is well laid out and comfortable. There are two bedrooms with en suite bathrooms…one on each floor. The beds are comfortable and room decorations including a good selection of books make you feel you are in your own own. The owners are terrific and will answer any question or concern you might have quickly. The housekeeper Lupe is a real gem. She comes to clean three times a week which she does thoroughly and takes great pride in what she does. There is also a gardener who arrives every couple of weeks and tends all the wonderful plants located on the three patios. The manager Norma is also a great help and responds immediately to any problem you might have while you are there. Esteban is the perfect place to stay while in San Miguel…it’s quiet, close to town, well taken care of and comfortable with wonderful owners. Couldn’t ask for more! We definitely should have booked it longer. However, it was not available the two additional weeks we decided to stay in SMA. Wow, were we ever spoiled. It has everything! Fabulous kitchen, bedroom, storage, washer/dryer and I could go on and on. Very warm and inviting. And Lupe was amazing. We will definitely book again. Thanks, Lorne, Steven, Lupe and Norma. Loved your place. We are very pleased that you enjoyed our home in San Miguel as much as we do. Looking forward to having you stay again. The unit is well appointed and very comfortable. Location is quite private which was nice. Very clean and fantastic property management and cleaning/gardening staff. Was a wonderful retreat over the holidays. I have stayed in many houses in San Miguel and this is one of my favorites. It is an excellent value, very comfortable, great indoor and outdoor space. 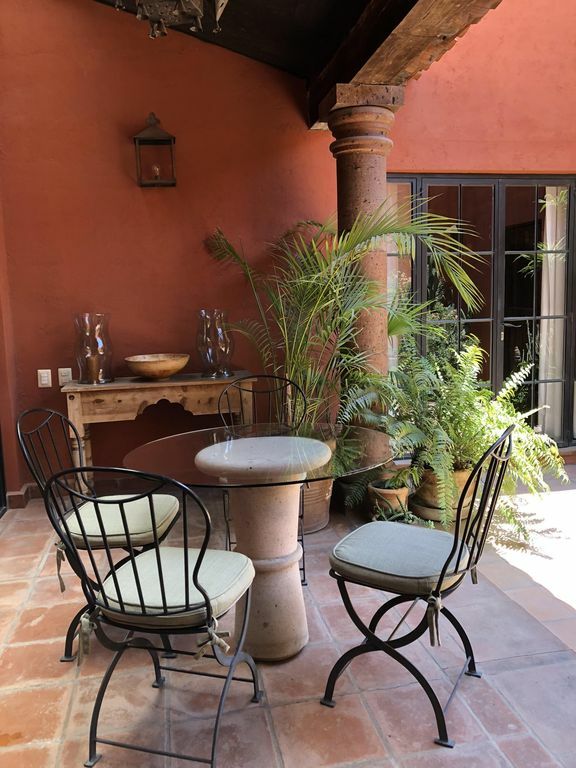 I am so happy to hear that you enjoy our home in San Miguel de Allende as much as we do. I do not feel there is more I can say that has been said. The owners are beautiful, truly genuine people who care that your stay is amazing. The house is perfect and I felt bad coming home to my own house, missing all the beautiful details at Casa Esteban. I would highlight a few things that made our 1 month stay amazing. The pictures really do not do it justice to show the flow of the house and the kitchen. We stayed with our (grown daughters) and barely heard them as we had the master bedroom downstairs and they were upstairs. Heavy Mexican terra-cotta tiled floors insulate all the sounds, it was heavenly. The master bedroom opens up one of 3 terraces, the house is surrounded by beautiful glass doors and windows so you feel the outside inside. The living room also opens up to the terrace as does the kitchen. There is even a 1/2 bath outside for guests. As folks have said, the kitchen is fully stocked: gourmet pans, espresso machine, juicer, all the small details like bakeware and serveware galore. We baked and cooked and entertained like it was our own home and everyone who came was impressed by Casa Esteban. The upstairs bedroom was also sweet, comfortable beds all around and a beautiful terrace off that second living room floor where I worked on my laptop. The house has good wifi and it was easy for us to work. The rooftop is the perfect place to enjoy cocktails and meals upstairs on the roof terrance or sunbathe on the comfortable lounge chairs. It has a gorgeous view of the town, el Centro and the cathedrals are all in perfect sight. All the details like outdoor shades and insanely beautiful succulent are everywhere. I was inspired by so many plants thriving creating such a lush environment. Roosters, fireworks and dogs barking are real, it is Mexico and I am sorry but you can't escape that anymore than you can the summer rains or midday sunshine but keep in mind the good fans they have in the house cancel all the noise. Lastly, Lupe the house cleaner comes 3 times a week, which at first I though would be too much but ended up my favorite days. She is delightful and helpful and loves the house as much as you will. They are very lucky to have the management they do, Norma and Lupe keep it all running like a hotel. Casa Esteban's neighborhood is quiet and just the right distance from the busy center. It has a good mix of Mexicans and foreigners alike. Close to great markets and shops and away from the bustle of Centro. Thank you for the fabulous review! You were the perfect guests. Rates are subject to changed until deposit is paid. Please check our calendar before contacting us, as it is always up to date. Please give us plenty of time to arrange to have you met at the house. Last minute calls may take longer to arrange.